Online card games. They’re pretty popular these days. There are traditional TCGs that spawned digital adaptations, like Wizards of the Coast’s Magic: The Gathering, as well as those games built from the ground up as a video game, like Blizzard’s Hearthstone. For me personally, having to buy digital cards despite owning a huge collection of Magic cards in order to play the online version was a turn-off that kept me from getting involved with it. Then one day, a package arrived at my doorstep: A box of cards for a game titled Malkyrs: Arenas of Eternity, by Malkyrs Studio, who aim to solve the problem I described with a hybrid: an online card game that is played with physical, tradeable game cards, through the power of NFC (Near-Field Communication) technology. I was immediately intrigued; an online card game that uses physical cards? I could not resist giving this a try! A few of the physical cards, including my Champion on the right. Malkyrs was born by the eponymous French development team after a successful kickstarter campaign, and is currently avialable in France, while a second (and also successful) Kickstarter campaign aimed to bring the game to the rest of Europe and North America (on PC, Mac and Nintendo Switch). In this game, you buy and collect some rather impressively sturdy trading cards (they are very thick and feel almost like credit cards), and scan them using a smartphone, a dedicated NFC reader, or the amiibo scanner on the Nintendo Switch controllers, which brings them to life in the game to activate their effects. Because the cards have NFC chips inside, the cards can be upgraded and their effects altered, and if you trade them to others, they will retain their altered attributes. Well, I can marvel at this creative use of NFC technology all day, but how does the game play? A sequence of card plays in a match. After playing a few games, it felt to me like sort of a cross between Hearthstone and the traditional card game War (where each player plays a card which then results in an outcome). 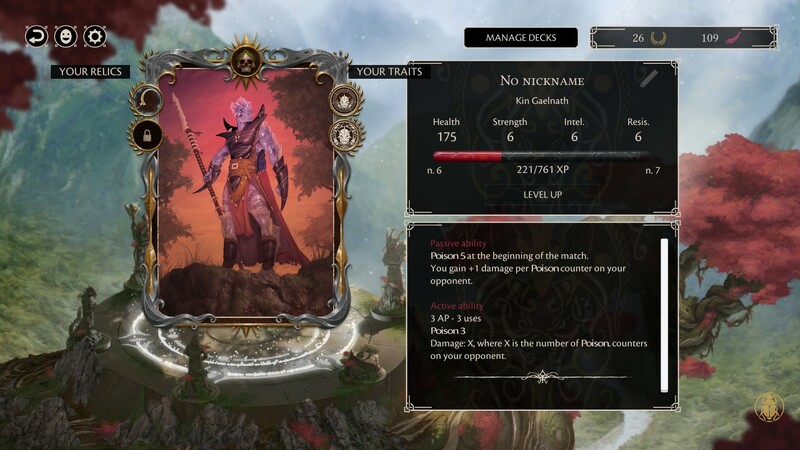 Each player has a Champion (Mine was Kin Gaelnath, who has a poison theme) with unique attributes, much like the heroes of Hearthstone – a champion card is thus required to play and one is included with the starter kits. Each player has a life total, and you win by reducing the opponent’s life to zero. 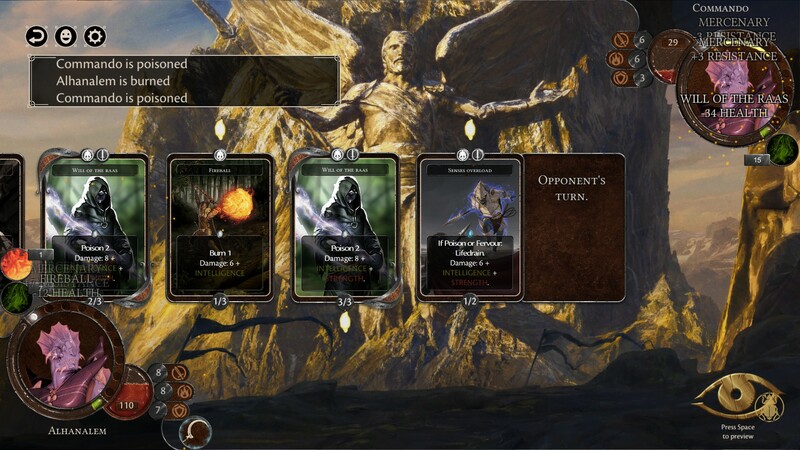 You have a “deck” (more like a hand) of ten cards, plus your champion card, and on any given turn you can play any one of the cards in your deck as long as you meet the requirements, such as their action point cost (AP are gained each turn). Players take turns playing cards, and the effects of each card you play only resolve after the opponent plays a card. It’s very straightforward and easy to play, but with a variety of champions, other cards, and your ability to modify them, a lot of strategy options are out there. Although the main focus is on the online duels, a local VS mode is provided, so two players can also battle it out face to face, not just over the internet. You can even use the same cards if you want; the game doesn’t appear to care about this. You can buy items in game to enhance your Champion. Visually, the game is quite basic, and I expect that it would run on very low end machines just fine, but the art in the game and on the cards is appealing and well done. The music is quite dark and atmospheric. It fits the game’s somewhat creepy fantasy setting well, and doesn’t get in the way of thinking and planning for your next move. Although I might have preferred something just a tad more energetic, it suits its purpose. I do have a few criticisms, although in fairness the game is still a fair ways away from its official English release. First off, the translation is rather incomplete at this time. It was enough for me to be able to play, but parts of the text are still untranslated as of this writing. My other criticism has to do with the cards: the only thing marked on the cards themselves is its type, maximum number of uses, and action point cost, so in order to find out what they do, you have to scan them into the game. This means you have to memorize the effects of the cards. During the game you can hold down a key as you scan a card to check it without playing it, but this is a little cumbersome. Having said that, while I did find this an annoyance, it does have a small upside in that since the text of the cards is all in the game, no errata ever has to be issued for the cards and balance changes can be made easily as a result. A champion card scanned into the game. You can customize them here. 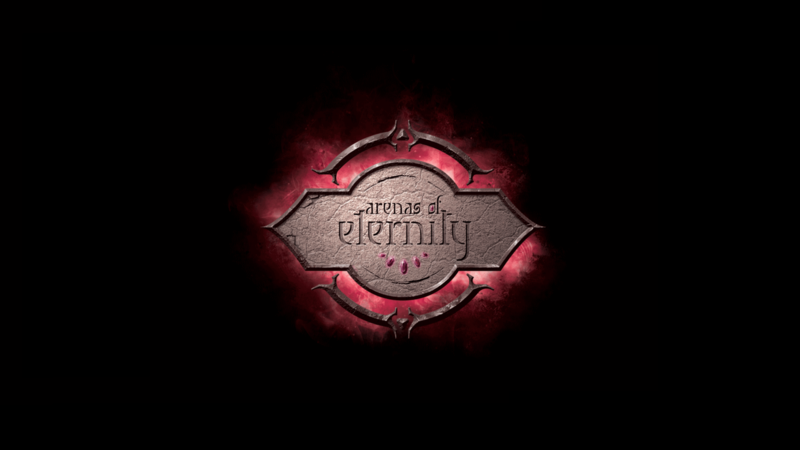 Malkyrs: Arenas of Eternity goes into its English Beta in June with a full release a few months later. 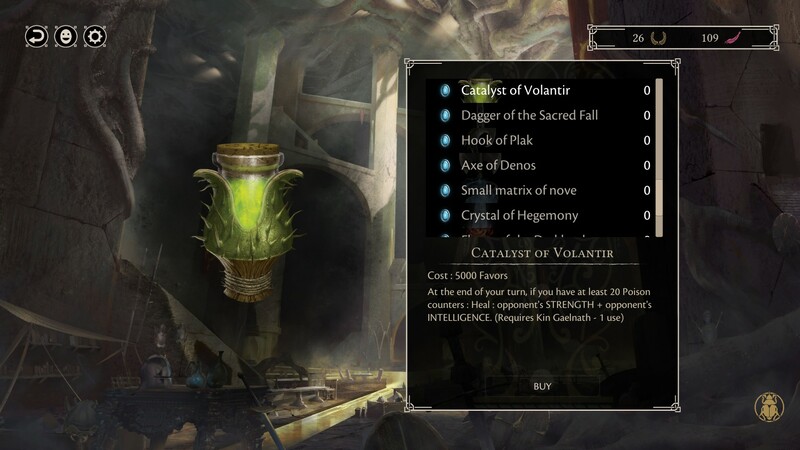 If this preview piques your interest, while the Kickstarter campaign has already concluded, late pledges are available which will allow you to acquire cards for the beta when it arrives. I must confess that I am tempted to do this, even if the cards are a bit on the expensive side (Starter packs with a champion look to be around $18 and three-card boosters $8 or so). 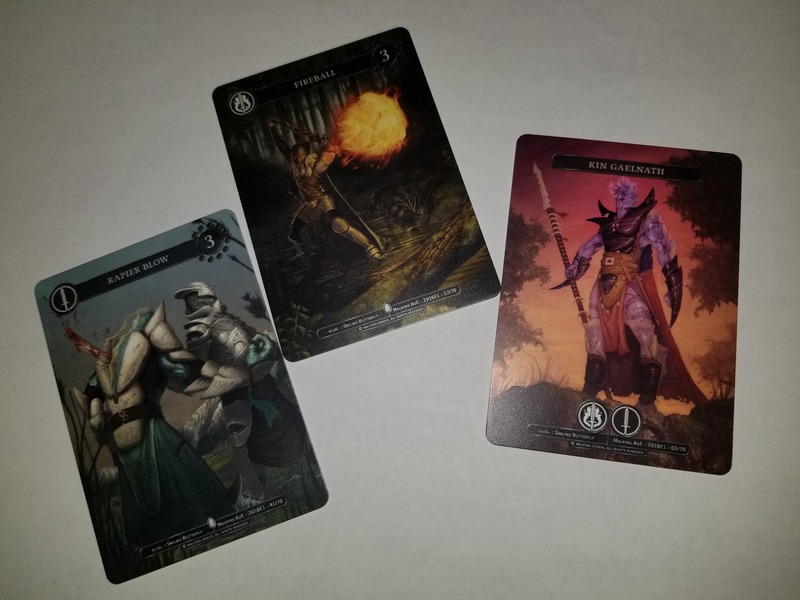 The hybrid card game concept Malkyrs created has got me fascinated, and while the game is a bit rough around the edges and missing some content (a single player campaign is planned), I enjoyed my time playing (and winning!) and I will be keeping an eye on this as it approaches the beta. A set of cards was provided by Malkyrs Studio for this preview. Screenshots and pictures taken by author.